New York-based Van Wagner Communications is seeking a five-year contract to wrap city buses in advertising even though the city sued the company in April, claiming that it illegally erected numerous supergraphic signs that created serious traffic hazards and endangered the lives of building tenants. The lawsuit, filed in L.A. County Superior Court, seeks millions in damages from the company and property owners who allowed the multi-story mesh and vinyl signs. According to a Facebook posting by the Regional Hispanic Chamber of Commerce, Van Wagner is seeking sub-bids from certified minority and women-owned businesses for various services related to the contract for advertising on the city’s 364 commuter express, DASH, and Cityride buses. 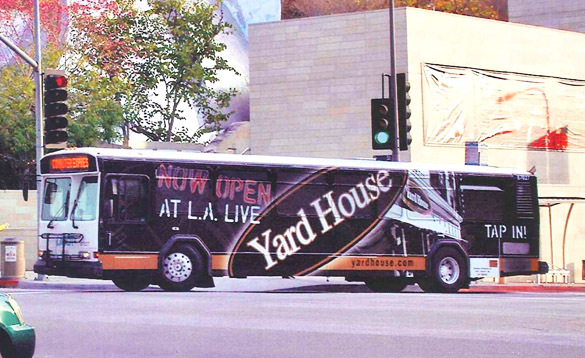 The contract guaranteeing the city a minimum of $500,000 in annual revenue would allow both interior and exterior advertising, up to and including full wraps of the buses operated by the city’s department of transportation (LADOT). The request for proposals issued in May by the LADOT requires the disclosure of all pending litigation in which bidders are directly or indirectly involved. The contract is tentatively set to be awarded to the successful bidder late next month, but the LADOT hasn’t disclosed the names of the companies submitting proposals. Van Wagner was one of more than a dozen companies that put up unpermitted supergrahic signs and then sued the city in federal court when the signs were cited, claiming that the city’s ban on such signs was unconstitutional. Those claims were rejected last year by the 9th Circuit Court of Appeals, and almost all the cases, included Van Wagner’s, have been dismissed. At one time, it was estimated that more than 200 illegal supergraphic signs were advertising movies and TV shows, fast food, cars, banks and other products and services in a wide area of the city. Nearly all those signs were removed after the appeals court decision. In a press release last year, Van Wagner admitted to having erected more than 60 of the signs, and touted their removal as an act of corporate responsibility.